Mark's post on William Clark's spelling mentions that Thomas Jefferson was a linguist. Among Jefferson's interests was the light that language could shed on history, particularly the history of American Indians. The American Philosophical Society, which holds what survives of Jefferson's vocabularies, including the page illustrated above left, has a nice discussion of Jefferson's work here. Indeed, one of the tasks of the Lewis and Clark expedition was to collect lists of words in Indian languages. This is mentioned in Jefferson's instructions to Merriwether Lewis. Regrettably, much of Jefferson's material was lost when it was shipped from Virginia to Philadelphia. The trunk in which it was packed was rifled by a thief who threw the linguistic material, which had no value to him, into the Rappahannock River. The sheets held by the American Philosphical Society are those that survived and were picked out of the mud. What many people don't know is that Lewis and Clark were not the first to reach the Pacific overland. A decade earlier, a party of Northwest Company men led by Alexander MacKenzie set out from Montreal and after overwintering at Fort Chippewyan, reached the Pacific at Bella Coola on July 22nd, 1793. The route he followed from the Fraser River to Bella Coola was an existing Indian route known as the "Grease Trail", Carrier /tl'inaɣeti/. The name comes from the fact that the most important item traded into the interior was the processed oil of the eulachon fish Thaleichthys pacificus. Indeed, the Carrier word /tl'inaɣe/ "eulachon oil" is a compound of Carrier /xe/ "grease, oil" (combining form /ɣe/) with /tl'ina/, a loan from Heiltsuk or Haisla, North Wakashan languages spoken on the coast. 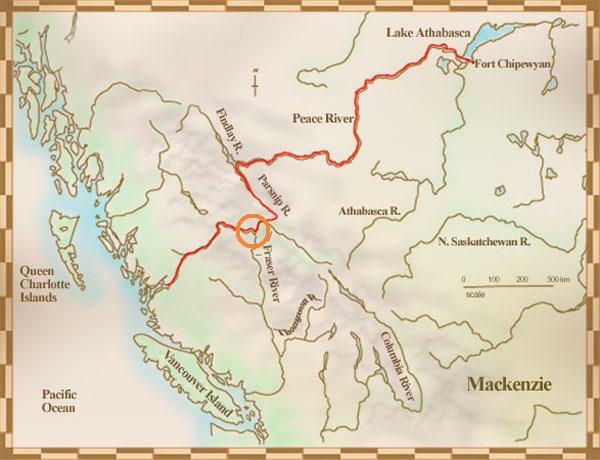 You can still hike this route, now known as the Nuxalk-Carrier Grease Trail, or as the Alexander MacKenzie Heritage Trail. MacKenzie's journey was primarily for the purpose of finding an overland route for the fur trade; it was smaller in scale than the Lewis and Clark expedition and was not explicitly scientific, though the Northwest Company was interested not only in the country but in its inhabitants, with whom they would have to deal. 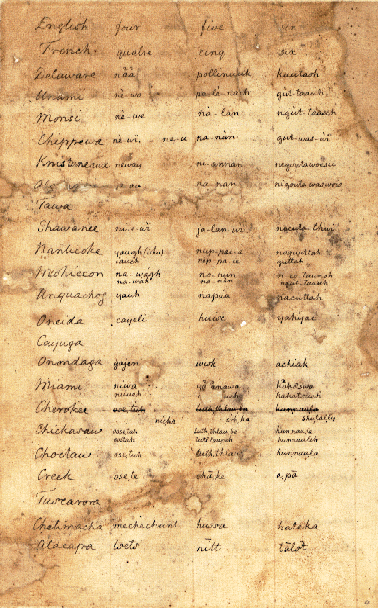 MacKenzie's Journal contains short word lists in several Indian languages, including the first record of Carrier, which he collected on June 22nd, 1793 while camped near what is now Alexandria reserve. The orange circle on the map of MacKenzie's route shows where he was camped. Here is MacKenzie's Carrier vocabulary. The headwords are the words as he wrote them. These are followed by his gloss, the modern form in IPA, if discernible, and in some cases comments. "leg" -/ketʃʌn/. The modern form consists of /ke/ "foot" plus /tʃʌn/ "stick". Either MacKenzie just didn't hear the first syllable, or in this dialect of Carrier at this time "stick" was used uncompounded for "leg". "ear" -/dzoh/. MacKenzie's transcription probably reflects /dzʌx/, which is the expected earlier form of /dzoh/. "woman" Perhaps /ts'eku/. If this identification is correct, and if MacKenzie is correct in glossing the form as "woman" rather than "women", it shows that the distinction between singular and plural nouns had already been lost in 1793. Athabaskan languages do not, in general, have distinct singular and plural forms for nouns. Most dialects of Carrier have distinct singular and plural forms only for nouns denoting people and dogs. In the southernmost group of dialects, however, the Blackwater group, even this distinction has been lost, and the word that means both "woman" and "women" is /ts'eku/. In the other dialects "woman" is /ts'eke/, of which /ts'eku/ is the irregular plural. On the other hand, it is conceivable that this dialect still had the distinction between singular /ts'eke/ and plural /ts'eku/ when MacKenzie recorded it, and that MacKenzie's <chiqoui> represents /ts'ekue/, a blend formed when a Carrier speaker started off with the plural form, then switched to the singular. "dog" /ɬi/. MacKenzie's transcription presumably reflects /ɬĩ/. "ground-hog". I can't identify this. "ground-hog" is /dʌtni/ today. "bow" Perhaps /neɬtʌɲ/ "our bows". This is currently pronounced /neɬti/ or /neʔʌɬti/ depending on dialect and means "our rifles", but there is other evidence for the sound change involved as well as the shift in meaning. arrow. Probably /ʔi k'a/ "it" followed by "arrow" (which generally means "rifle cartridge" today). "yes". I can't identify this. "yes" is /a/ at present. "come here". I can't identify this. "come here" is /ʔanih/ at present. His spelling of dog indicates that Carrier still had nasalized vowels. On the basis of comparison with the other Athabaskan languages Carrier must at some point in the past have had nasalized vowels, but it no longer does, and even records from the late nineteenth century don't show it. The fact that MacKenzie wrote <th> where older speakers of the current language have /t̪s̪/, as in "hair", "head", and "tongue" (but not, for some reason, "stone"), suggests that he heard a true interdental affricate [tθ]. Nowadays, older speakers contrast apico-alveolars (like the usual American English pronounciation of /s/) with lamino-dentals. The distinction is difficult to hear and has been lost by younger speakers, who have merged the lamino-dentals with the apico-alveolars. The lamino-dentals were very likely once interdental, as their cognates are in some related languages. One surprising feature of MacKenzie's word list is that it gives the bare stems of the body parts: "eye", "hair", "teeth", "nose", "head", "hand", "leg", "tongue", "ear". Carrier is a language in which body parts, as well as kinship terms and a few other nouns, are inalienably possessed. That is, they cannot be used in isolation but must occur either as part of a compound word or with a possessive prefix. A Carrier speaker will never say /na/ for "eye". He or she will say /sʌna/ "my eye" or /nena/ "our eyes" or /hʌbʌna/ "their eyes" etc. If he wants to refer to an eye without saying whose it is, he will say /ʔʌna/ "an eye, someone's eye". A common problem with lists of words such as this collected by people who did not have much knowledge of the language and were unfamiliar with this phenomenon is that they give as words for body parts or kinship terms forms that actually contain a possessive prefix. It is remotely possible that the body parts were not inalienably possessed at this time in this dialect of Carrier, but very unlikely, since they are today and are in all of the related languages. If they were inalienably possessed, it is a surprise that MacKenzie shows the bare stems. Perhaps he obtained more than one possessed form and extracted the common part as the stem. He never mentions any such analysis, nor is there any evidence that he had any interest in linguistics, so this would be surprising, but either he did this, or one of the Carrier speakers had performed the same analysis on his own language and gave MacKenzie bare stems. Somebody did a surprising bit of morphological analysis back in 1793.